*This recipe gets its name from the green broccoli, edamame (soybeans), asparagus, and snow peas. Combine white wine, orange juice, soy sauce, rice vinegar, red pepper flakes, and water in a small bowl. In a large wok, heat one tablespoon of canola oil over medium-high heat. Add the beef and cook, stirring, until just browned, about two minutes. Transfer the beef to a plate. Heat the remaining tablespoon of oil over medium heat and cook garlic until fragrant, about 30 seconds. Add snow peas, broccoli, asparagus, and edamame. Raise heat to medium-high, and cook until for three minutes until vegetable are slightly softened. Add the wine-soy mixture and cook, stirring, until edamame are cooked and asparagus is crisp, but tender, about four minutes. Add the beef and dissolved cornstarch and stir to incorporate. Cook until mixture thickens slightly and beef is heated through, an additional two minutes. Drizzle with sesame oil and serve. 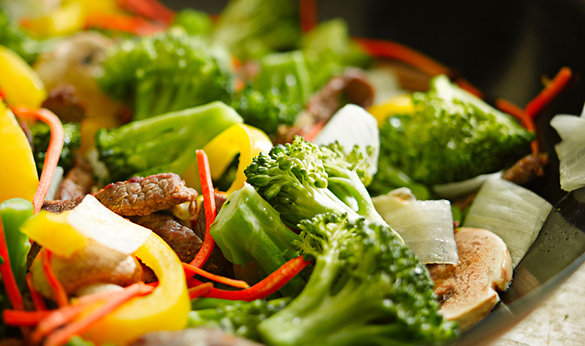 Enjoy this emerald wok stir fry recipe.